This momma was super excited yet a bit nervous about her Tampa family photoshoot. We spoke on the phone, discussed the plan, decided on outfits and then we waited for our date! It rained - boo! 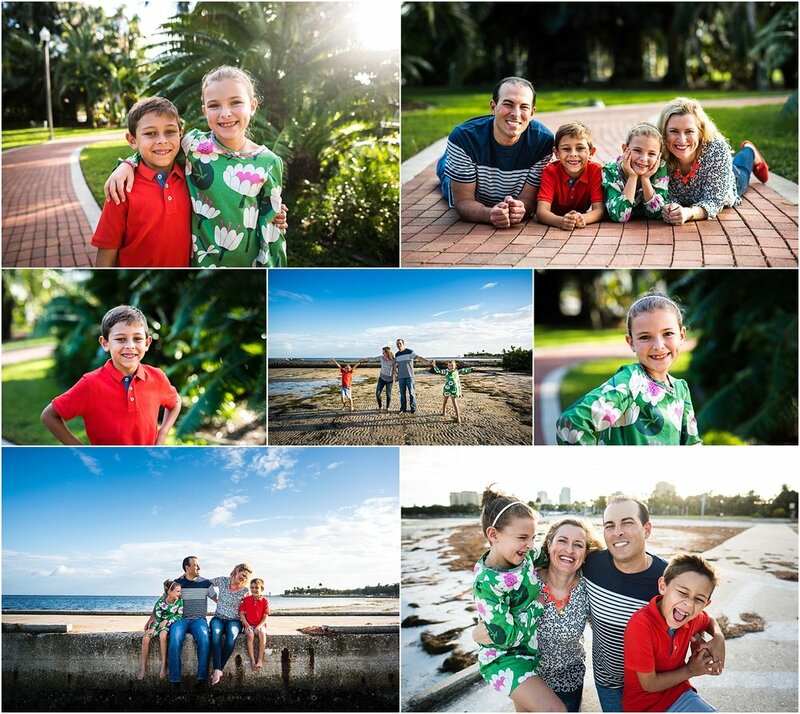 So, we rescheduled and we ended up with the beautiful evening for our family session exploring downtown Tampa. When you bring yourself to our family session - when you relax - when you enjoy your family - and trust I'm there to capture the best moments - then YOU make the best moments for me. You do! Yes, I'm watching the light, looking for interesting backgrounds, have control over my professional gear -- but without your personality -- it's really not that exciting. You have to bring who you are and then I capture your family memories for you to keep forever! That's what this family did -- all three of them! We moved around all parts of downtown and created this gorgeous gallery of images. Keep scrolling for all the goodness! How cute - she wanted to capture the love of reading they have in their family! Tampa, Florida 2018 Mini Session Information! I will be offering a limited number of mini-session. These will be held back to back and the focus will be on group family images and individual children shots. **Please note if any large public events are scheduled at any of these locations I will choose a new location. When you decide on a date and time, please email me your top 2 choices at maggie@maggiefullerphotography.com. I will send you a contract that will include the required deposit of 50% which will secure your spot. The remaining 50% will be due at the time of the shoot (through the same payment method). Below are some examples of previous mini-sessions. We adventured 2 hours north of Tampa to cool off from the August heat and enjoy the Florida Springs....our adventure included a 2 hour tube float on the Rainbow River, a picnic, and jumping and swimming in the Rainbow Springs. With a little planning ahead, we were able to head out of Tampa around 7am, which got us to the Rainbow River tubing location at 9am, before the parking lot filled up. We had 8 families meeting up to do the 2 hour tube float and there was a little confusion within our group of the exact location - the address that will bring you to the correct launch for the 2 hour tube ride is 10830 SW 180th Ave Rd, Dunnellon, FL 34432. The website with a bit of info is here. I found I had more questions about preparing for our trip....so here goes our summary! The link above does include some rules like kids have to be 5 years old to tube and that no coolers are allowed down the river. There is also an option for a 4 hour trip - different location and different rules apply. We headed to the main building to buy our tickets ($20 each, save your receipt), pick up life jackets, and use the restroom. After all 8 families completed the check in process we left all of our "stuff" in our cars, gave our keys to the office and waited for the tram. NEXT TIME - the flip flops / water shoes are not needed. The walk back from the exit point to the parking lot was fine to walk barefoot. Also, the river was fairly deep so my feet weren't touching the bottom at all. While floating, the kids actually liked having their tubes separate - they could jump off, stand up, and enjoy freedom. When they were linked it was more challenging for all of that. We waited for the tram for 10-15 minutes, then the tram ride was around 10 minutes. We each grabbed a tube and headed to the launch which lead right into the cool, brisk, beautiful water. Listening to everyone walk/jump/run into the water was hilarious. The water is a constant 72 degrees which is a bit chilly for us Floridians. With the sun shining on our backs we got used to the temperature quickly. Here is a snapshot of our first few minutes on the river. I was immediately thrilled by the crystal clear water and the beautiful green colors of the grass on the bottom. We had read differing information of the length of the float, which likely varies due to the current. Our trip was 1 hour 45 minutes, but felt like only an hour as we enjoyed every second. The "I'm hungry" cries from both kids and adults started 10 minutes before the end as it was just after noon so our timing was perfect. After our tube ride we planned to drive to the main "headsprings" entrance of the park to picnic and swim in the headsprings. Keep on scrolling for more info and tips on this part of our adventure. Exiting the river was obvious and easy with a 5-10 minute walk back to the main office. After depositing our tubes and life jackets we were back at our cars and driving the 10 minutes to the headsprings entrance. The headsprings area of Rainbow River State Park had so much to offer with pavillions, grassy areas, the swimming area and more places to explore (that we didn't make it to). After enjoying our packed picnic lunch we wanted to jump into the spring with the kids....then we quickly burned off some of lunch with the amount of treading water we had to do! The spring is deep with no place to rest -- which is why everyone had noodles. We weren't aware of this, so treading water was our only option! Noodles are the only approved flotation device allowed in the spring and next time we will definitely bring some along. We were on our way home around 3pm eating the rest of our snacks and already discussing when we plan to return! My mini-session registration is open and they are filling up fast. Details here!